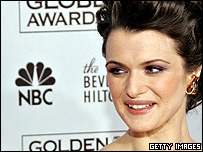 Golden Globes-winning actress Rachel Weisz thanked a Cornish film producer for his part in the Constant Gardener. Simon Channing-Williams from Marazion co-produced the film which won Weisz best supporting actress. The Constant Gardener is the story of a British diplomat whose wife threatens to expose pharmaceutical companies testing drugs on Africans. The awards, regarded as a curtain-raiser for the Oscars, took place in Los Angeles on Monday night. Weisz praised the "great dignity and finesse" with which Mr Channing-Williams created a relationship with poor people in Kenya for the film. The film has another Cornish connection in John le Carre, who lives in Zennor and penned the original novel.